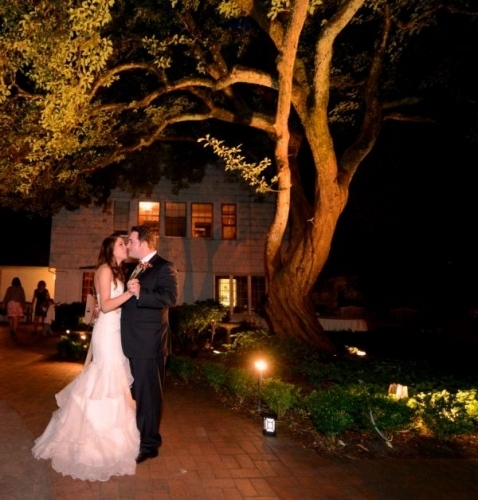 Voilà Catering Service will custom design a wedding reception menu to fit most any gourmet’s wedding dream from a buffet to a Family-style served dinner and from a server-passed Appetizer Menu to a wine-paired multiple course plated meal. 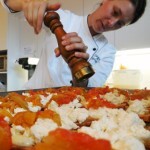 Contact us and let Executive Chef Tamara Kay develop a unique catering menu to fit your theme and budget for a one-of-a-kind wedding reception that your guests will rave about for years! 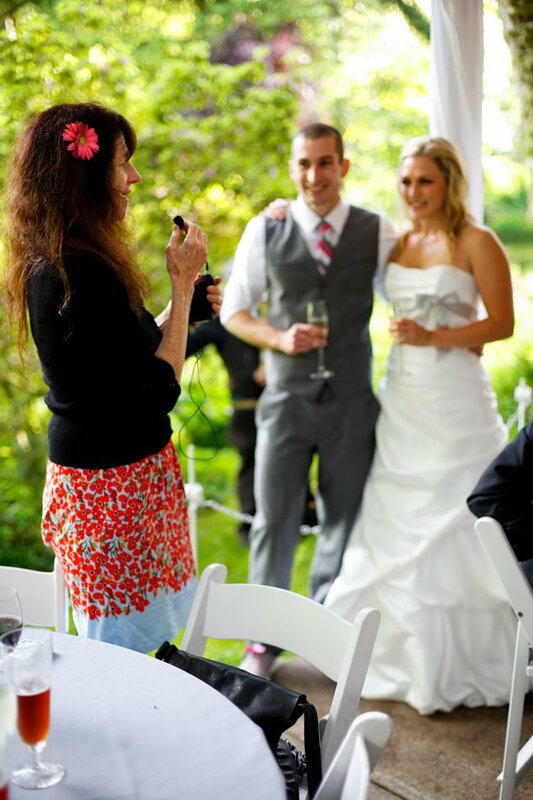 We invite you to see what our past clients and guest have said about Voilà Catering on our Reviews page. 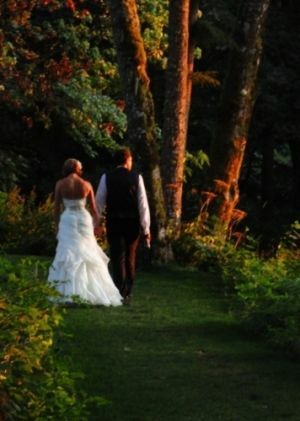 If you have not picked a location for your wedding or reception, some suggestions around Portland include the Castaway in the Pearl, Gallery 903, David Hill Winery, Abiqua Country Estates, McLean House in West Linn, The Little Church, The Colony, Newell House, Four Graces Winery, First Presbyterian Church, Cathedral Ridge Winery in Hood River, Red Ridge Farms, Maple Leaf Events, Columbia Arts Center, The Holy Names Heritage Center, The Laurelhurst Club, Elk Cove Winery, Mountain Park’s Grand Lodge, Bridal Veil Lakes, Laurel Ridge Winery, or the Hoyt Arboretum. Visit our Locations page for more information and links or contact us for a free consultation. Popular wedding weekends start to book up 6 to 9 months prior to the event. To check our catering availability, contact us with your desired date, location, expected guest range, length of reception and a description of your desired menu and service style. Our top priority is for your event to be a success, so we recommend booking early as we are careful not to overbook our resources. 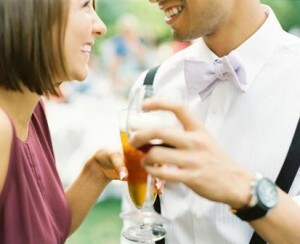 After the ceremony, typical wedding receptions start with an 45 to 90 minute passed hors d’oeuvre and beverage period. 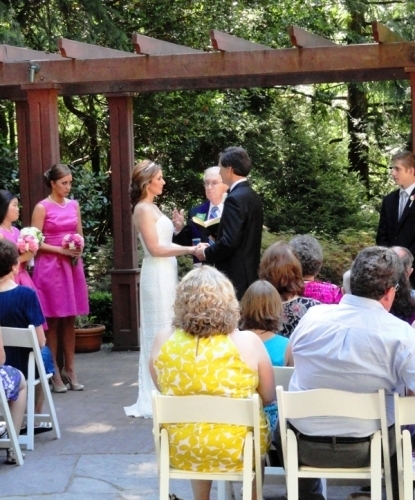 This time period allows guests to mingle and chat with distant friends and family. 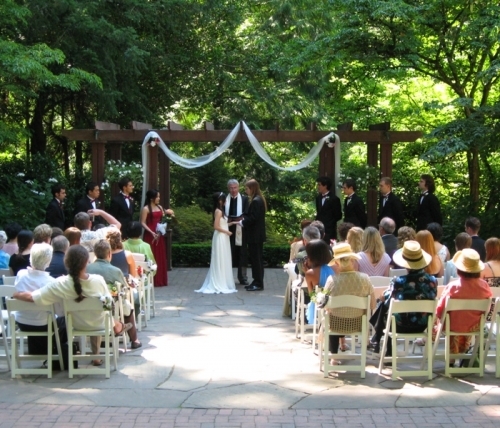 Often the bride and groom use this period for photos or to get away to a private space after the ceremony. Meal service can range from a basic buffet to a family-style sit down dinner to a formal plated meal depending upon the feel you want for your event and your budget. 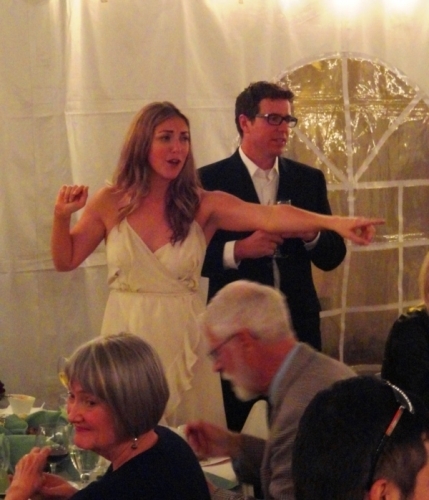 Other typical activities include formal toasts and speeches, cake cutting ceremony and dancing. While there is a traditional order to these events, we are pleased to guide our brides and grooms to do it their way! 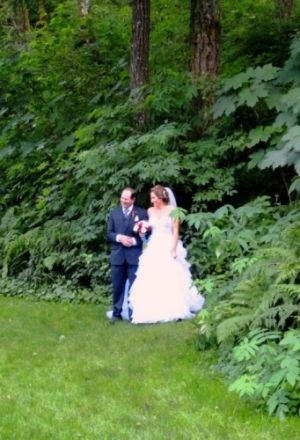 For past examples of weddings, click here to see our blog of recent weddings planned and catered by Voila Catering! After confirming our availability to cater your wedding reception, we are pleased to schedule a complimentary consultation to understand your specific event desires, share our experiences, and then develop a custom proposal. You want your wedding to be special and unique, so all menus are custom designed with Executive Chef Tamara Kay for your event, location, theme, and budget and will feature the fresh local ingredients at their peak of ripeness of the season. With hundreds of menu options, unlike other catering companies, we do not limit your selection to a few standard menu choices. 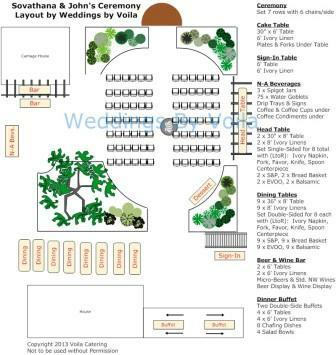 Because the details matter and we want your event to be surprise-free, Voilà Catering provides a multiple page spreadsheet detailing food quantities and portions, event schedule and staffing levels, breakdown of every rental item, and expected beverage costs. Voilà Catering provides full service catering from a simple self-serve buffet to an on-site cooked, plated and served multiple-course meal with wine pairings. Your budget, party size and event site greatly influence the services that would be most appropriate for your special occasion. 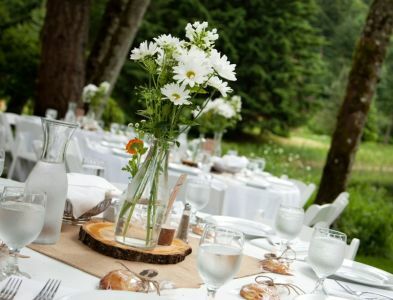 We are pleased to assist you in selecting the best catering menu and services for your event. The basic level of service is Buffet Service. Guests take a plate from the beginning of the buffet and serve themselves from a selection of salads, hot entrees, sides and breads. Our servers refresh the buffet as guests remove the food. 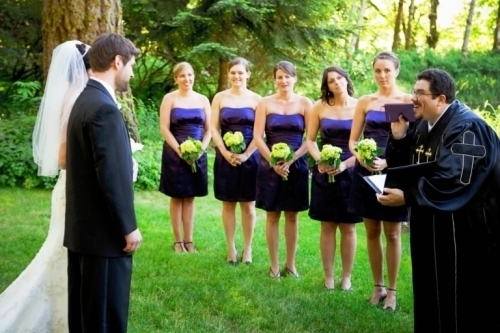 Voilà Catering always provides detailed proposals assuring adequate portions sizes and quantities. As guests always want to sample all the delicious food offerings, we always serve at least one portion of every item for every guest. Buffet style of catering service requires the fewest servers and is therefore is usually the most cost effective for your wedding reception. 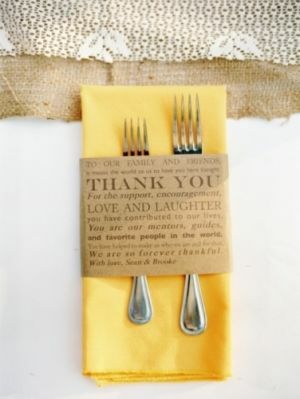 Very popular at family gatherings such as weddings, Family-Style service is a definite step up from Buffet Service. Your wedding guests get to sit down to a chef-plated salad featuring seasonal fruits or berries, cheeses, and candied nuts with a made-from-scratch dressing. When complete, our catering service staff removes the salad plate and salad fork revealing the dinner plate. Then, our professional chefs plate hot-out-of-the-oven food on large china platters which are brought to the tables by our uniformed servers. The serving platter with appropriate serving utensil is passed from guest to guest, each taking their desired amount of food. If we are providing several courses, we recommend you share the anticipation of the coming courses with a menu card. Family-style service encourages interaction at the table and keeps the guests all eating at the same pace together. 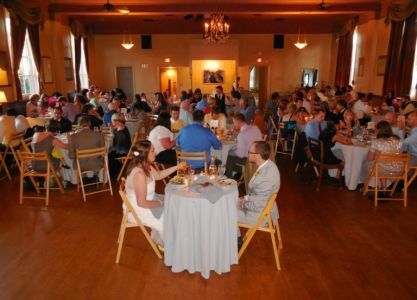 For medium and large events, Family style catering provides more elegance than a buffet at a cost significantly less than an individually plated and served meal. Chicken Braccioli stuffed with mushrooms and fresh spinach then prosciutto wrapped! 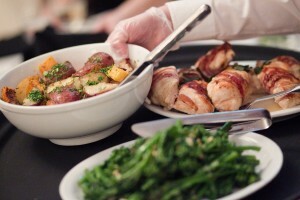 The ultimate in service, the individually Plated and served meal provides restaurant elegance at your event. Each course is artfully and individually plated by our staff of chefs and served by uniformed professional servers. The number of chefs and servers is determined by the complexity of the menu, the size of the event, and the level of luxury desired. In addition to delicious food, we can also make recommendations for pairing wines with each course. 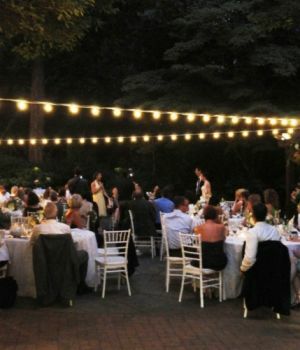 Voilà Catering is pleased to provide professional rental management, cocktail bartending, event management, site set-up and site tear down services to ensure that your event is a success. If your event required heavy custodial or equipment moving services, we are please to contract those activities to an appropriate service. 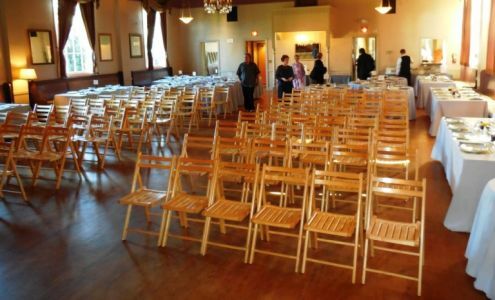 Your event cost will depend upon the number of guests, the length of your event, the cost of your food selection, the rentals required for your event site and the beverages consumed by your guests. Your wedding reception is truly special and we make it unique. We do not offer one-size-fits-all, generic wedding packages. 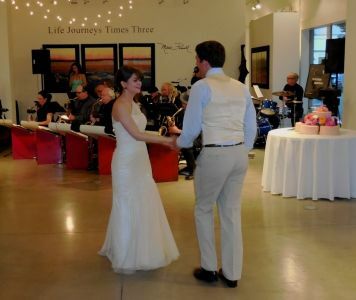 Your costs for a wedding reception with Voila Catering are based upon the cost of the food, the cost of the service and staff, the cost of the beverages, and the cost of the party rentals. 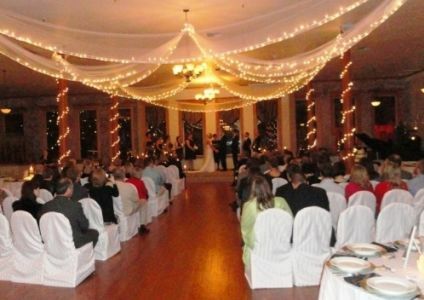 Most all medium and large sized wedding receptions generally cost between $40 and $90 per person complete. Voilà Catering can provide classic Continental/European, traditional American, Californian, Northwest, Asian, Mediterranean, Caribbean, Italian, Spanish, Peruvian, New England, and Southern foods. All menus are custom prepared for you under the direction of Executive Chef Tamara and our professional chefs use only fresh seasonal ingredients to maximize food quality. Voilà Catering does not use pre-made frozen appetizers, frozen soups, mass-produced lasagna, pre-made salad dressings or marinades, or powdered mixes. With no exceptions, all menu items are made from scratch in our commercial kitchen. 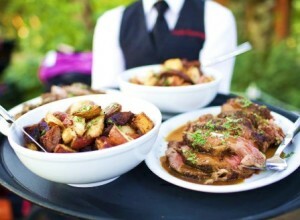 Voilà Catering is not your typical catering company. 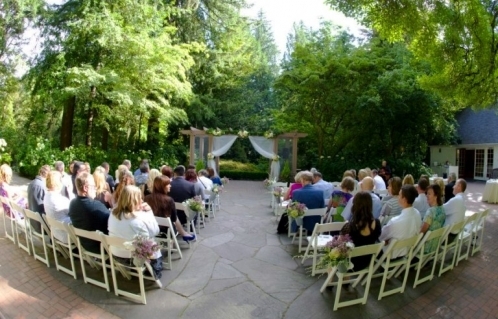 We know we can not meet every person’s exact desires and accept that we may not be the perfect fit for every event. For quality reasons, there are some foods and menus that are offered by other catering companies which do not meet our standards and we chose not to offer. We only utilize ingredients that are in season to maximize food quality and to minimize your event cost. In consideration of your guests, we do not typically offer messy BBQs or meat choices that have difficult-to-eat-around bones at weddings or formal events. While very inexpensive, we do not offer pasta buffets at large events for food quality reasons. We are pleased to develop a custom & seasonal menu around your desires which your guests will rave about for years! As all menus are custom designed for your event, special dietary needs can be accommodated. Low fat, vegan, vegetarian, low cholesterol, sugar free, dairy-free, peanut-free and gluten-free menu ideas are available. If you have a few guests that have special needs, we would be pleased to provide alternative selections for them. How and where do you prepare the food? All our food preparation occurs at our licensed commercial kitchen by our professional chef team. For optimal food quality, our chefs always cook your hot menu items at the event site with our portable commercial ovens and propane burners. 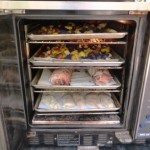 Food that is just cooked is infinitely better than food that has been holding in a warming container for hours. We do not “finish-off” or reheat already cooked food for obvious quality reasons. All our food is transported cold in special insulated commercial containers for high quality and food safety. We are very proud of our super-clean commercial kitchen and we encourage you to visit our 4,000 sq ft offices/kitchen/warehouse. 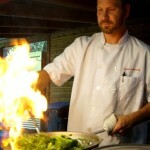 We are pleased to introduce you to our chef team and see how and where your food will be prepared. Call us to schedule a visit at our commercial kitchen! How will the food be plated or displayed? Do you have pictures of previous events? 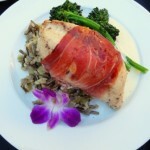 Cooked On-Site Prosciutto Chicken Breast, Roasted Red Potatoes, and baby Broccolini Family Style Dinner! As appearance is as important as taste, Voilà Catering has a variety of modern display serviceware for buffet service. 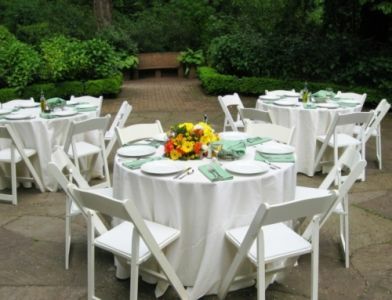 Voilà Catering’s buffet service ware is always china, stainless steel, pottery, or other natural products…never plastic! At buffets to keep hot food hot, Voilà Catering always provides hot water chafing dishes at no extra charge. Because your wedding is a special once-in-a-life event, Voilà Catering does not serve on paper plates or with plastic utensils. 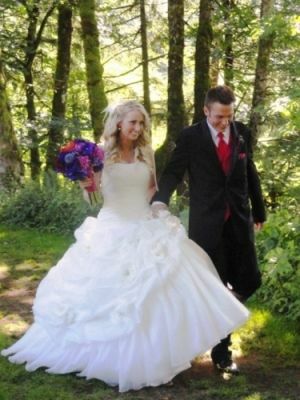 Visit the Wedding Photos page, the Locations pages, and the Photo pages for pictures. To see hundreds of images from our events and to hear from our clients, click here to visit our facebook page and ‘like” us to keep updated on our latest events! 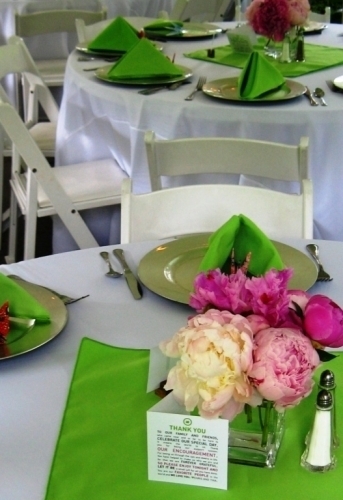 Voilà Catering will rent, deliver, set-up, tear-down, and return all needed linens. 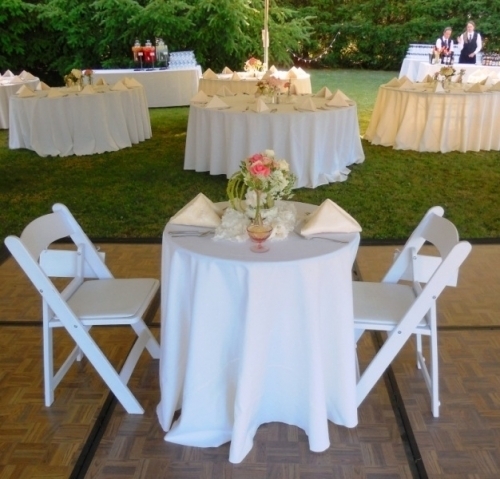 All linens are guaranteed to match in color and be free from soil and runs. Our linens are the soft and absorbent “Fortex” material which is a superior material quality to the standard material offered rental companies in Portland. All linens are floor-length and custom fitted to each standard table size for an elegant finished appearance on all tables. Do you have a broad range of linen color selection? Voilà Catering provides a selection of 42 standard linen colors plus many specialty fabric and pattered linens. .
Do you supply glasses, plates, and silverware? Voilà Catering will rent our own beer glasses, white wine glasses, red wine glasses, water glasses, elegant champagne flutes, china appetizer plates, china dinner plates, china dessert plates, and stainless steel flatware. If you are having a full bar or just a specialty cocktail, we can also provide cosmopolitan, rocks, martini and high-ball glasses. For the ultimate in beverage service, we also now offer German Crystal Stemware from Schott Zweissel. 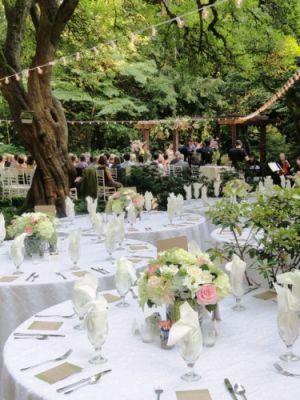 In addition, our preferred rental company has a wide range of china patterns, glassware, flatware, and gold and silver-plated flatware that Voilà Catering can manage for your event. 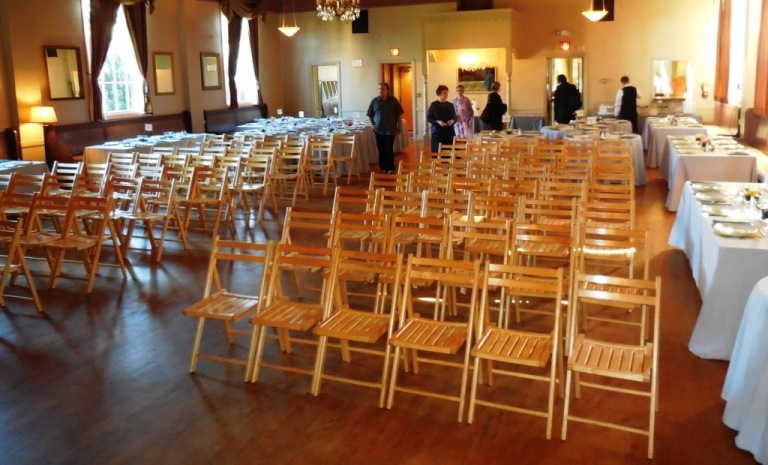 Do you handle all rental equipment such as tables, chairs, decorations, and tents? Voilà Catering owns many of our own chairs, tables, lighting, and other typical event rentals. Our rates are competitive with rental companies. Voilà Catering can manage all aspects of rental equipment including delivery, set-up, clean-up and return. Voilà Catering does not markup the rental company’s standard rates and does not require pre-payment for the rentals. 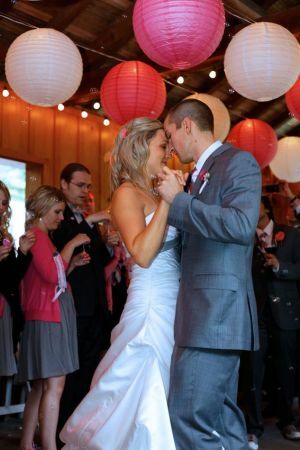 Setup by the rental company is included in the cost of the dancefloor and canopy tents. 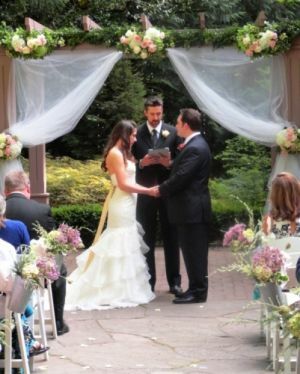 Do I need to hire an wedding planner or coordinator? Who will manage the event? 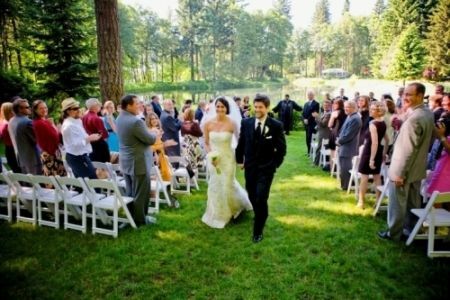 Voilà Catering provides a professional on-site manager who is responsible for all aspects of your event from pre-planning to clean-up. 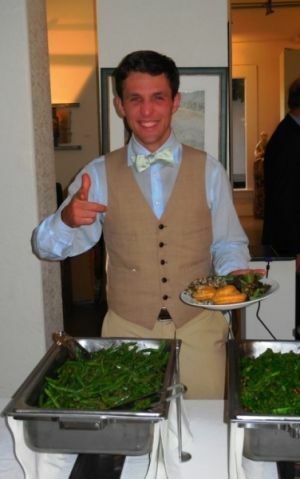 Voilà Catering provides all our own professional servers in our own crisp clean uniforms. 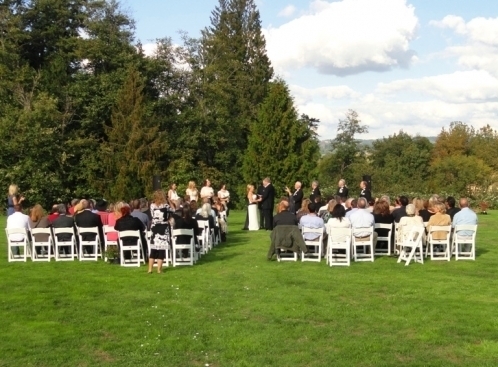 Voila will provide all event planning and management for your special day. 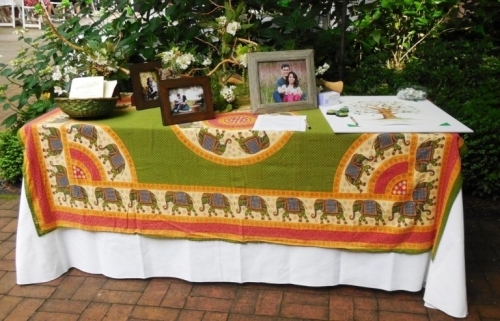 Setup of wedding accessories such as guest book, table numbers, favors, etc. For all but the largest and most complex wedding, a Day-Of Wedding Coordinator is typically NOT needed which can save you thousands. 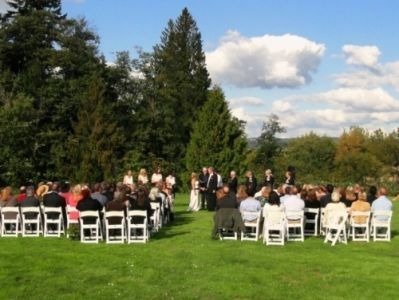 If you have special circumstances and you desire rehearsal and wedding coordination on your special day, Voila Catering can provide these additional services at a reasonable rate to assure smooth and integrated event management. Information about our additional services with cost information is detailed at www.WeddingsByVoila.com. 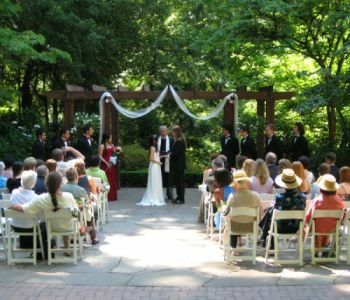 It is so unfortunately that due to a variety of disappointing experiences with outside hired wedding coordinators, it is company policy that all day-of coordination and professional planning be conducted by Voila only. Do you make arrangements for flowers and decorations? We are not florists and we work with a few selected florists. We would be pleased to share with you our expertise and make arrangements for flowers and other decorations using our preferred suppliers. We are always pleased to put your floral arrangements on the tables! 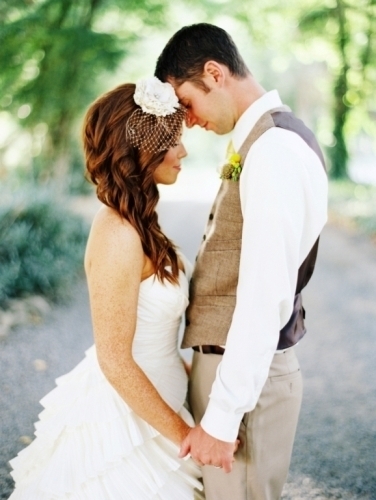 Do you provide the wedding cake? Voilà Catering is not a bakery and does not provide wedding cakes. We have seen cakes from many different bakeries and would be pleased to recommend the best bakeries. Voilà Catering can also provide other desserts to compliment your cake and provide delicious sweet dessert alternatives for your guests. 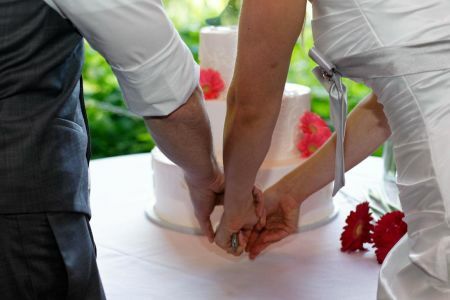 Voilà Catering does not charge a fee cutting your wedding cake. Do you provide beer, wine, champagne, and liquor? 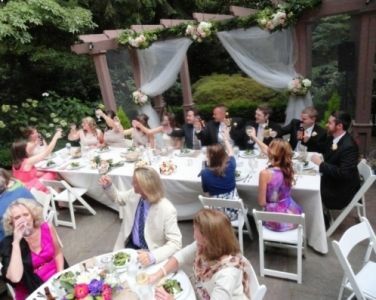 Voilà Catering provides the full range of beverage services (beer, wine, sparkling, and mixed cocktails) with professional licensed servers and the peace-of-mind of $1 Million in liability insurance. To guarantee smooth and successful performance at large events, it is our policy to provide ALL the food, beverages, rentals, and service. Voilà Catering believes that beverages can be an integral part of your event which cannot be easily sub-contracted to another vendor successfully and economically. We do make exceptions for winery and brewery venues where they serve the venue’s products. 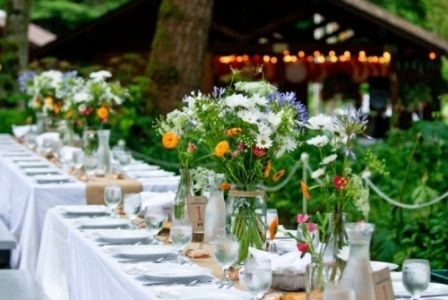 According to OLCC law and responsible business practices, Voilà Catering will only serve alcoholic beverages when substantial food and non-alcoholic beverages are available for the guests. Voilà Catering will require age verification for any guest who appears under 30 and will not serve to individuals who appear intoxicated. It is our policy not to offer hard liquor shots at our events and it is against state law for us to offer self-service alcoholic beverages. Is it cheaper if we provide our own alcoholic beverages? For weddings and large events, Voilà Catering exclusively serves only our own alcoholic beverages for liability and event quality reasons. Voilà Catering purchases alcoholic beverages at the same prices as every other licensed store and re-seller in Oregon and we are competitive with most every other retail source. Our beverage offerings range from our own non-alcoholic iced tea infusions to innovative and elegant cocktails. Northwest wines sold based upon consumption start at only $9.75 per bottle and Northwest Microbeers at $2.75 per bottle consumed. There is no minimum and beverage service includes pre-chilling beverages, ice, ice chests, elegant display containers and off-site recycling of empty containers. Unlike when you buy the all alcoholic beverages yourself, you only pay for those that are consumed. Bottled microbrews and NW wines typical cost $4 to $7 per person at most wedding receptions. 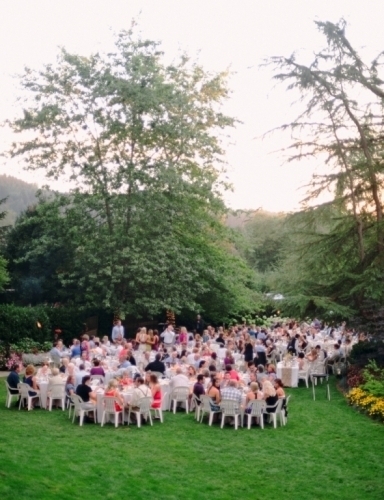 For large receptions of greater than 150 people, keg microbrews and NW wines will cost a bit less. 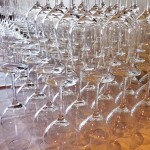 Do you charge a corkage fee if we provide our a special bottle of champagne or wine? Voilà Catering does not charge a corkage fee and would be pleased to open a special bottle for the bridal party at no charge. How do we know what we will be getting for our money? Voilà Catering will provide exact portion size information for each menu item and will breakdown our quotation for food, service and rentals. Our 11 page event plan provides all the details for a transparent quotation. We will let you specify the portion sizes of your entrees so you know exactly how much food your guests will be getting. Our objective is for you to not have any unexpected surprises in any aspect of your event. In our quotation, we will specify a cost per person for a range of guest attendance. Prior to a final count, if your attendance changes outside of that range, we will provide a new event plan with revised costs. Do you automatically add a gratuity and are there additional service charges? Voilà Catering does not have a required or expected gratuity. We pay an above average wage to our professional staff and it is our standard expectation that the service at your wedding will be excellent. 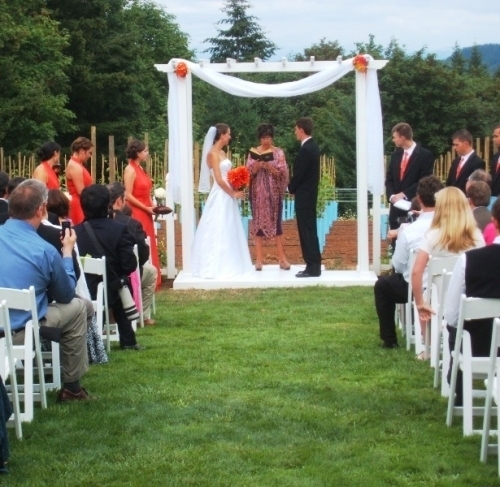 Voilà Catering will provide a detailed proposal for your event with all the expected costs. We do not add on any “customary” service charges or other surprise service fees. Do you require a deposit and what is your payment policy? 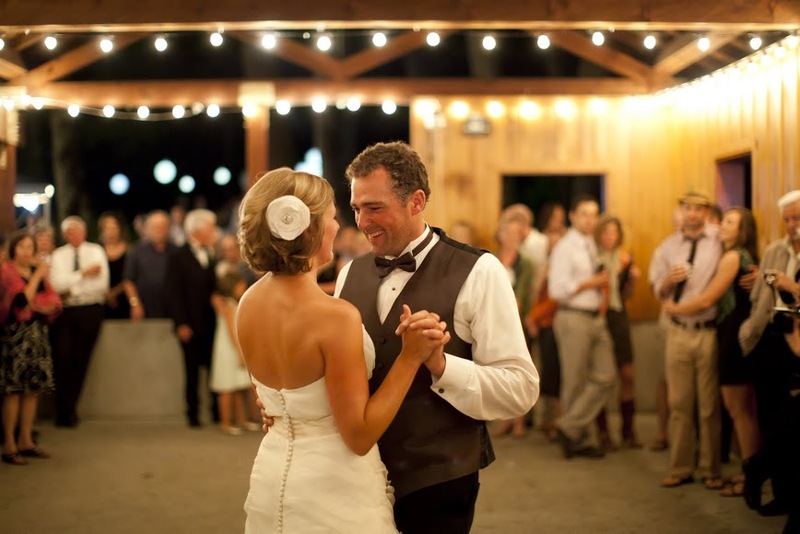 Voilà Catering requires a $500 deposit to hold your date up to three months before your date. 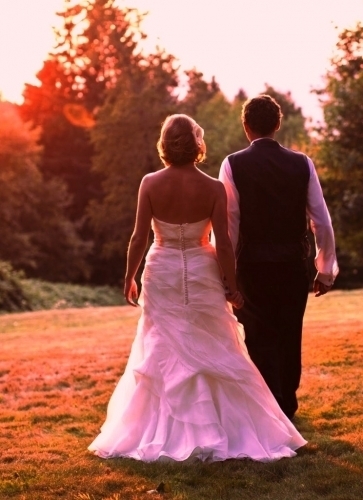 We request a non-refundable deposit of 25% of the anticipated cost to be paid 30 days after booking the wedding date. All deposits go towards the final cost of the event. Final Payment for all costs is due the week before the wedding. To keep our prices reasonable by avoiding credit card processing fees, we accept only cash and checks. When do you need a final attendance count? 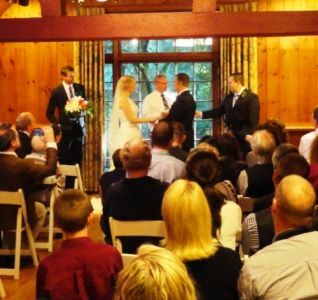 Generally, a final count is only required two weeks before the wedding. If your menu requires exotic meats or other special order items, a final count may be required earlier. Do you offer food tasting and references? In our first consultation, we can offer a complimentary meal of seasonal food that we have in our kitchen that is representative of our catering food. 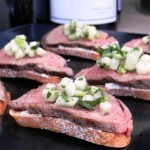 After selecting your custom menu, Voilà Catering can prepare specific food items for tasting at our commercial kitchen. As all the food is made from scratch, we will have three to four hours of Chef preparation time to get ready for a tasting. To offset this cost, we charge between $75 and $150 for a tasting depending upon ingredients and menu items. Voilà Catering also proudly operates Cafe Voilà at 901A SW Washington in downtown Portland. As an alternative to conducting a paid tasting, the Cafe features our everyday gourmet lunch food and can be tried at anytime. We are proud of our newspaper and magazine reviews on our “Cafe Voilà” page. Please visit our Reviews page for detailed client feedback on our events. Additional contact information can be made available upon request. To see hundreds of images from our events and to hear from our clients, click here to visit our facebook page and ‘like” us to keep updated on our latest events! Will you pack a to-go box for the bride and groom? 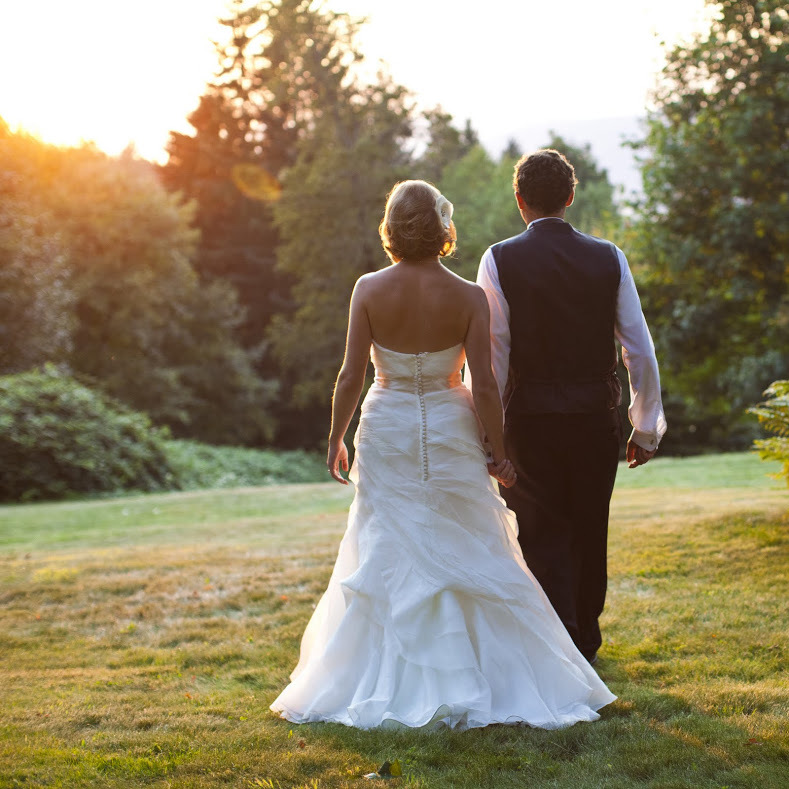 With all the excitement of the reception, sometimes it is difficult for the bride and groom to relax and enjoy the food, so Voilà Catering is pleased to pack a special package of excess food for the newlyweds. What will be done with the extra food? While we will not up-sell you into purchasing too much food, often times there is undoubtedly a little extra food and Voilà Catering will pack up the food in to-go boxes for the client and guests to take. We strongly recommend prompt refrigeration and appropriate storage of all food products taken from the event. As part of our “Company” mission to be a responsible community member, in the unusual circumstance were there is an over-abundance of food, Voilà Catering will also take extra food from your event to a local charity for donation whenever possible. 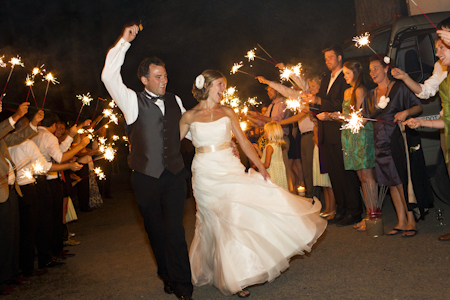 Reception Sparkler Send-Off planned and executed by the Voila team! 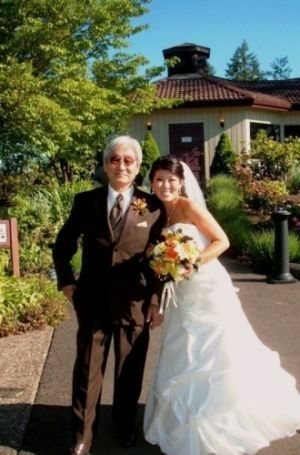 Why should I choose Voilà Catering? A Gourmet Custom Seasonal Menu, designed just for You! Reasonable beer and wine prices based upon consumption with no minimums. Professional Event Management and friendly Uniformed Servers. No additional Charge for Rental Management. 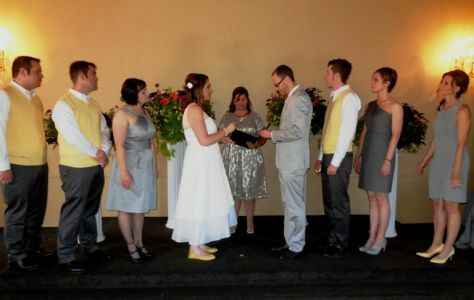 No Required or Expected Gratuity, No Cake Cutting Fees, No Corkage Fees. Wonderful Food and Service with No Surprises! How do I contact Voilà Catering for my Special Day? Please contact our Events Planner, by phone at 503-806-6658, our office at 503-788-5094, or by email at events@voila-catering.com. We would be pleased to arrange a meeting at our commercial kitchen or at our Cafe Voila to discuss your event, propose some menu and service options, and help you plan your special day. 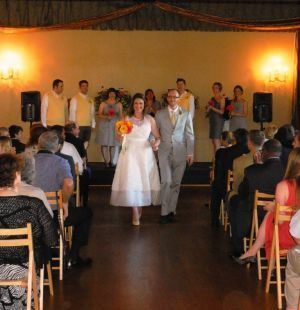 The Recessional for the Newlyweds....Success!!! Sweetheart table with plated dinner for Newlyweds and Family Style served dinner for guests! 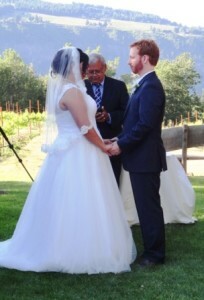 Just Married with the help of Voila at Bridal Veil Lakes! 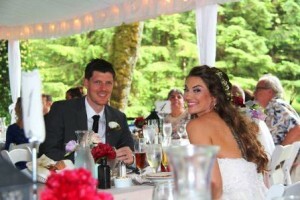 Bride and Groom: now newlyweds! Recessional for the newest married couple! Dining tables set by Voila Catering staff. Rainy weather moved ceremony inside! Organized by the Voila wedding team, this sparkler send-off was a great hit! 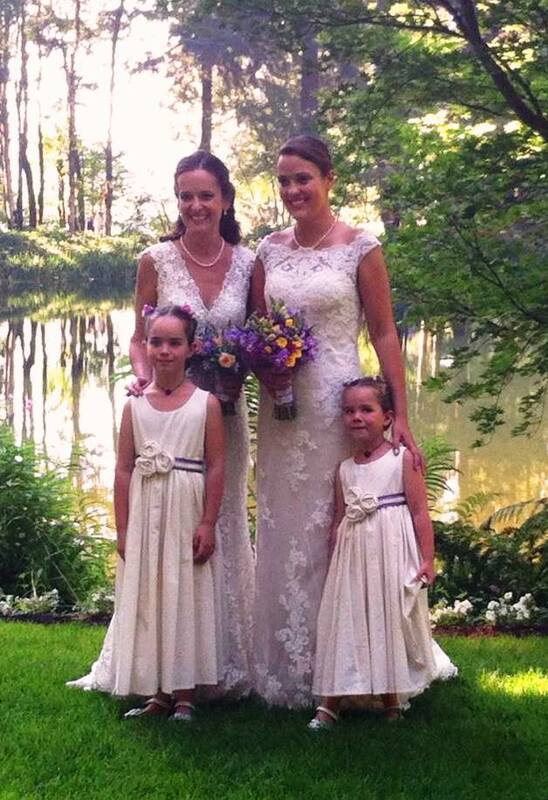 Megan and Cristin were our double brides at Bridal Veil Lakes in 2013! It was a great event!